A great deal of research and discussion went into the creation of the Professorville Design Guidelines. If you're curious about the Guidelines, or are thinking about a future project concerning Professorville, some of that work might be of value to you. In this web page I've described several important observations made during Guidelines project, provided some of the raw data that the Design Guidelines Committee considered, and linked to some tools for looking at the data. The vast majority of this page is intended to be simply factual. I've taken considerable effort to verify it, but I'm sure I've missed a few things. I've also included a few opinions that are strictly my own, written in the first person. Please don't assume the other Committee members share responsibility for any errors or opinions. They have different perspectives, and I hope they'll pass along their thoughts, too. To justify its creation, a district should have at least one unifying element or theme that ties together all or most of the structures within its boundaries. The National Register also requires historic districts to have a unifying principle, such as shared past events or a fundamental plan or aesthetic. Age alone is not enough; everything that survives eventually becomes old, even if it is not individually significant or relevant to a larger whole. So one of the first questions City Staff posed to the Committee was What is the unifying principle of Professorville? Answering that turned out to be more difficult than you might think. Here were built, and still stand, many of the earliest homes of professors at the then-fledgling Leland Stanford Junior University. These sturdy frame homes epitomize the dignity and hospitality of “Turn of the Century” architecture. Many of them predate both the Earthquake of 1906 and all but the earliest professors’ homes on the Stanford campus itself. “Professorville” is the oldest substantial surviving residential section in Palo Alto today, and retains the serene atmosphere now sadly lacking in most of the remainder of downtown Palo Alto. In order, Textor stated four unifying principles for the District: The homes of early professors, turn-of-the-Century architectural styles, age, and a serene atmosphere . The Professorville Historic District is significant due to both its historic associations and its architectural/environmental values. The district was one of the earliest residential areas in Palo Alto, housing a large proportion of the first professors to instruct at the fledgling University. As such its residents helped to shape not only the standards, directions, and intellectual atmosphere of the University, but those of the community as well. The primary values of the district lie, however, in its visual contributions due to the consistent character and high quality of the buildings and streetscapes that comprise it. Landscaping qualities contribute strongly to the character and ambience of the area, as do the Colonial Revival and Craftsman shingle covered structures which largely constitute the architectural makeup of the district. Here the primary values of the district are described as visual, rather than historic. Landscaping is given weight comparable to that of specific architectural styles. Professorville is no longer the oldest substantial surviving residential section ; it's one of the earliest residential areas . These changes were necessary because the National Register nomination covered a much larger area than the Point of Interest nomination. Many houses in the National Register district were not early professors' homes, many were not in the original architectural styles, and many were newer (up to the 1930s) than the homes in the original area. With this definition, however, Professorville is not so different from other neighborhoods with high-quality buildings, many Colonial Revival and Craftsman-style homes, and attractive landscaping. In a multiyear project concluded in 1993, the Historic Resources Board (with City Council approval) expanded the district again. The expansion changed the mix of ages and architectural styles for both significant and non-significant houses. Interestingly, the majority architectural style for Category 1 (the most significant) buildings in Professorville is now Spanish Colonial Revival (introduced here in the 1920s), not Colonial Revival or Craftsman (from the 1890s). The expansion of a district can be a good thing for controlling undesirable development. However, the introduction of newer houses and architectural styles and histories and landscapes may mean that there is no longer a unifying idea that applies to all or even most of the houses in the district. This makes it much more difficult to find a prescriptive set of design guidelines, which are supposed to be based on unifying principles. The Committee searched for defining characteristics for the District, which the Guidelines would be written to preserve. Areas of research included construction dates, professors' residences, building characteristics (size, materials, massing, etc. ), architectural style, historical significance, and landscaping. Natalie Loukianoff, Pete Childers, and Gogo Heinrich performed a survey of the entire District. For each house they determined the architectural style, date of construction, historical category, and whether it had been the residence of one of the early professors. I converted the information into a Google Earth database you can download to view it in many different ways. For example, here are the houses built in the 1890s. The logos indicate homes of professors, and the yellow dots indicate other homes. To help orient you, North is at the top, and Waverley Street runs roughly between the upper-left corner and the lower-right. The earliest construction took place near the center of the District. A burst of building up to 1910 concentrated in the area southwest of Waverley. Later construction established Kingsley Court, built up the area northeast of Waverley, and filled in gaps near Embarcadero. Colonial Revival and Craftsman are heavily concentrated in the western part of the District, southwest of Waverley but especially along Bryant, Ramona, and Emerson. Other styles are in the majority northeast of Waverley and dominate small neighborhoods elsewhere. Overall, the most frequently occurring styles in Professorville are Colonial Revival (38%), Craftsman (24%), Contemporary (19%), and Spanish Colonial Revival (6%). Ten others together account for 13%. The professors are noticeably concentrated on Bryant, Ramona, and Emerson, with some on the southwest side of Waverley and just a few scattered northeast of Waverley. Non-professors are distributed much more uniformly. 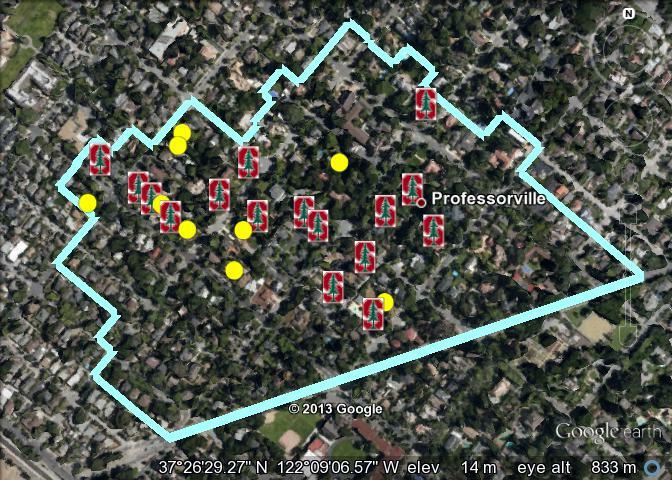 Altogether, 27% of the houses in Professorville were built for early Stanford professors. 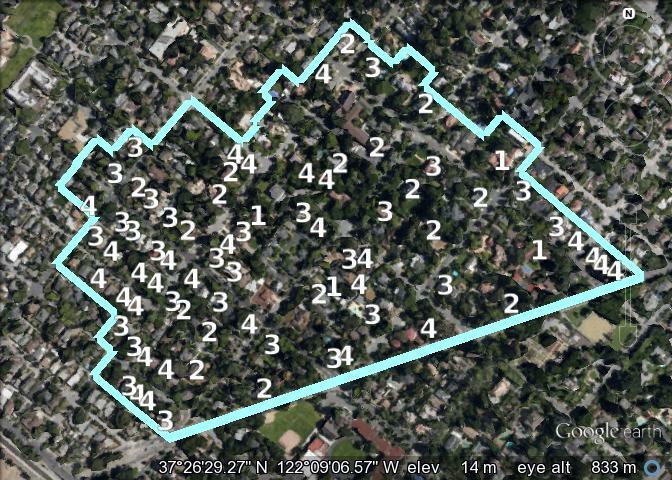 Palo Alto uses a numbering scheme (I believe derived from one used by the State Office of Historic Preservation) to indicate the significance of individual houses. Category 1 is most significant; 2, 3, and 4 are progressively less-so. Non-category houses are not considered significant individually (though some may contribute to the District in other ways). There are fewer significant houses northeast of Waverley, but there are also fewer non-significant houses northeast of Waverley; roughly the same fraction of houses are significant on either side. Altogether, 39% of the houses in Professorville are in a numbered category. 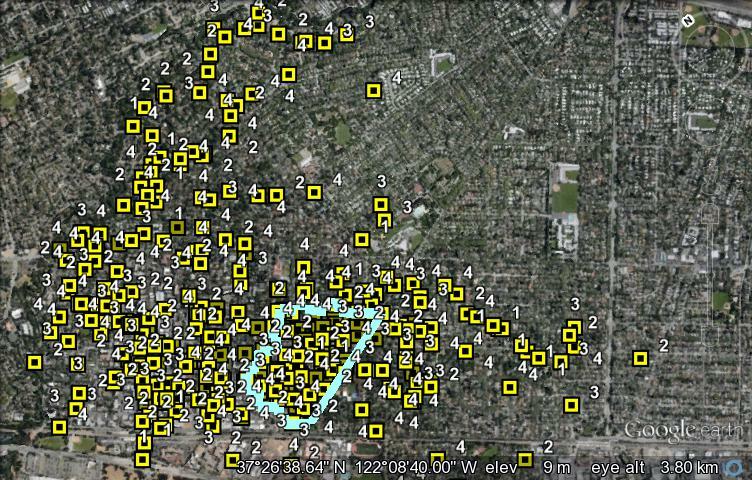 It's a little hard to read at this scale, but the following image shows the distribution of numbered-category buildings near downtown. These account for nearly all in Palo Alto. The Professorville boundary is in blue-green, and Alma Street is at the bottom. There are clusters of commercial buildings along University Avenue and Alma, and a scattering of residential buildings in Downtown North, Crescent Park, and Community Center. (There are also a few in College Terrace, not visible here.) However, there is a very high density of significant houses in University South, Professorville, and Old Palo Alto near Embarcadero. Professorville isn't unique in this respect, but it is exceptional. The physical characteristics (other than architectural style) of houses and lots in Professorville might be unusual, so we wanted to compare them to those in nearby neighborhoods. 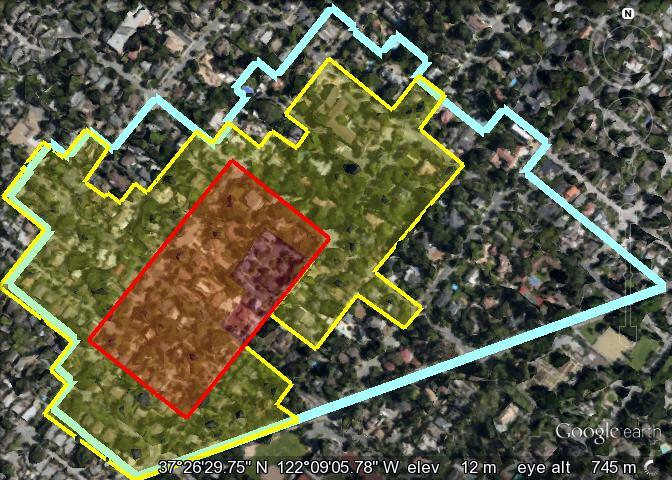 It's fairly easy to get lot size information from the Assessor's maps. 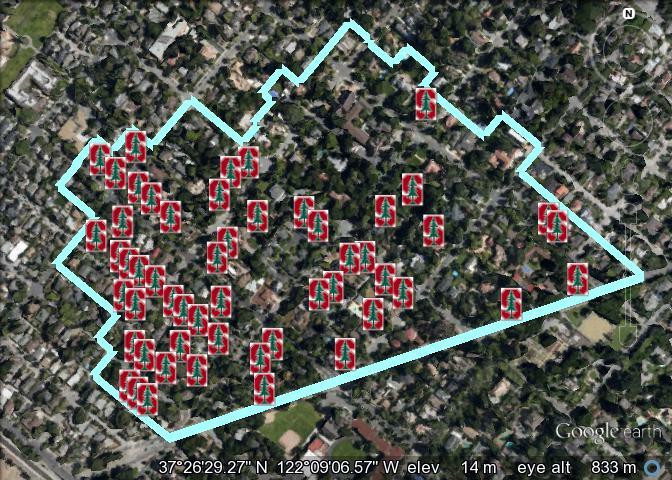 The Palo Alto Geographic Information System (GIS) can provide structure plots, from which we can infer how much of the lot is covered by the house. Unfortunately, we weren't able to find easy sources for height and massing information; that would have been very interesting. 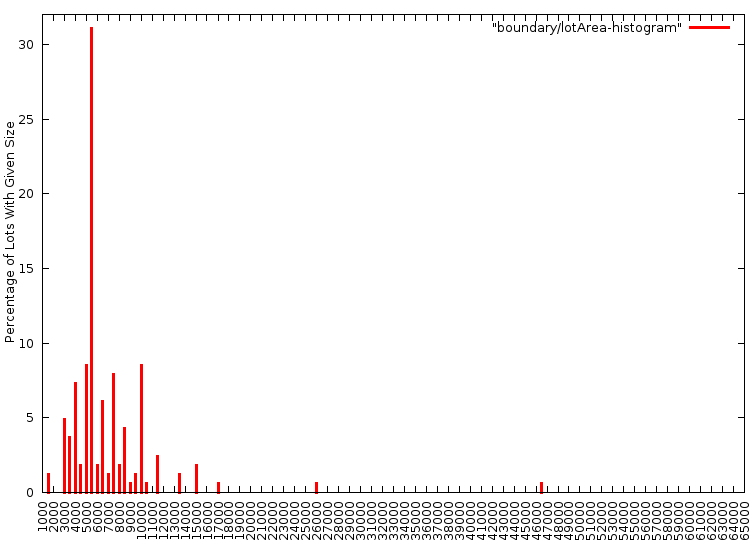 The highest peaks in the two plots don't coincide. Many Professorville lots are small by comparison to Crescent Park. Professorville also has a more uneven distribution of lot sizes, with a high percentage of small lots (consider Bryant, Ramona, and Emerson Streets) and a handful of much larger ones (consider the lots northeast of Waverley). Crescent Park has a more uniform distribution. Although Community Center lots tend to be smaller than those in Crescent Park, the overall picture is similar; lot sizes are more evenly distributed in Community Center than in Professorville. 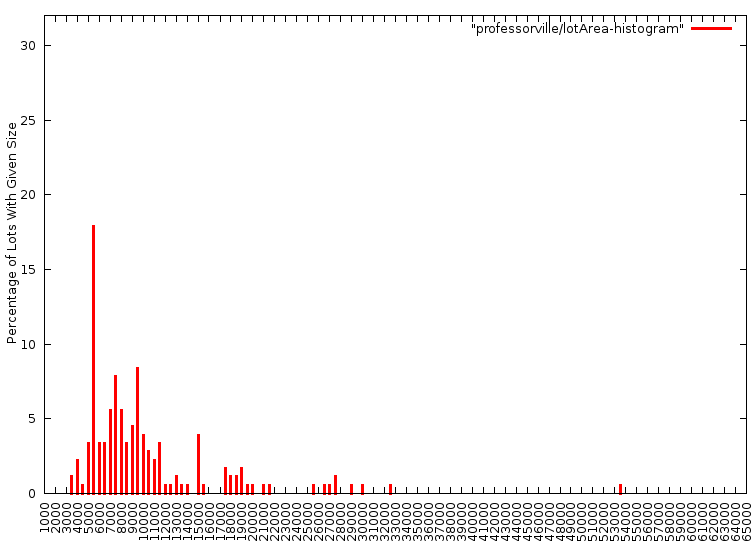 Notice how the peaks in the Professorville and University South plots tend to coincide. Also, the distribution of lot sizes in the two neighborhoods is fairly similar, with the exception that Professorville has more large lots. The reason for this is probably the evolution of the boundaries of the District. This image shows the (approximate) boundary of the original Point of Historical Interest area in red, the National Register Historic District in yellow, and the 1993 Extended District in blue-green. (Note the cutout from the National Register District below left of center; Kingsley Court wasn't included in that District.) Over the years Professorville has annexed more and more of University South, so it shouldn't be surprising that it has come to look more like University South than the original Point of Historical Interest. 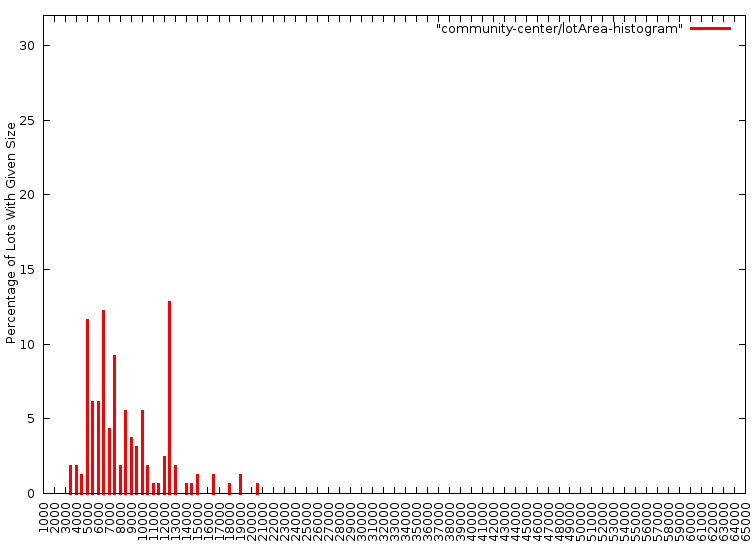 Due to lack of time, we only have data for Professorville and Crescent Park. 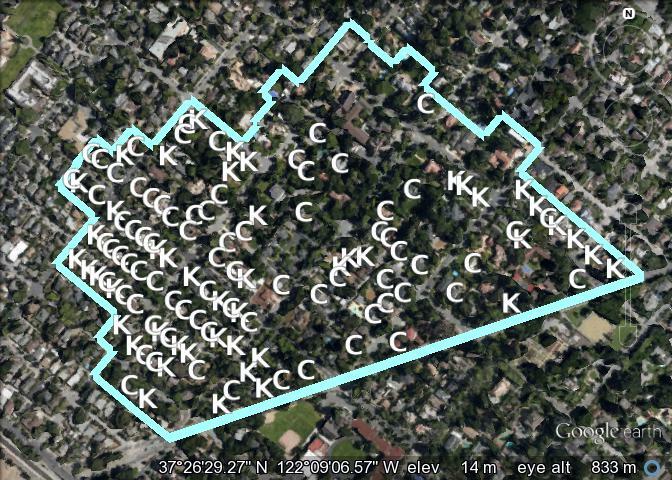 Professorville houses tend to cover about 31% of their lots, while Crescent Park houses tend to cover about 28% of theirs. (Neither of these differs very much from the Palo Alto zoning regulations for new houses.) The historic norms seem to allow a little bit more coverage for Professorville than for Crescent Park, but not enough to make Professorville unique. Arguably all the formal descriptions of Professorville over the years have invoked landscaping in some way. The Committee discussed it, and felt it important enough to recommend it be included in the Guidelines. However, we reached few conclusions about specifics. Anecdotally, yards in Professorville are more enclosed now than they were in 1900. High hedges block sight lines and screen houses from view; low fences form barriers between pedestrians and the public areas of yards. Many Mediterranean-influenced house styles have courtyards. Some of these features were present in the 1920s, but they're used much more extensively today. There are practical reasons for some of these changes. For example, drastically increased vehicle traffic calls for better sound barriers between streets and yards. Dogs are no longer allowed to wander freely, so some enclosure for pets is necessary. New houses and additions must meet increased setback and daylight-plane requirements, so it's less likely that delineation will be accomplished by the buildings themselves. Nevertheless, a case can be made that increased enclosure detracts from the serene atmosphere of the district. In short, this is an area in which more work might be helpful. How Well Do the Original Principles Apply Today? Only 27% of the homes in Professorville were built for early Stanford professors. Clearly that principle no longer applies to all or most of the structures within the boundaries of the District. Turn of the century architectural styles, Colonial Revival and Craftsman, still outnumber other styles. However, they don't unify the entire District because styles tend to cluster. Colonial Revival and Craftsman dominate Bryant, Ramona, and Emerson, but they're in the minority in the area northeast of Waverley. With respect to age, original houses in the District span more than forty-five years (roughly 1891 to 1938). This is too great a range to say that the District is the oldest residential area in Palo Alto; parts of it are old, but parts are not. It also represents a period of rapid change in the city and at Stanford, including events like the incorporation of the city, the 1906 earthquake, and World War I. I think it's hard to build a compelling argument that all or most of the houses share a set of significant past events that would unify the entire district. It's reasonable to unify specific groups of blocks in this way, but not the entire District. With respect to visual characteristics: I would say that the District is attractive almost everywhere, but it's attractive in ways that vary from neighborhood to neighborhood, rather than in a way that unifies the entire District. Compare the densely-packed Craftsman and Colonial Revival houses along Ramona to the Spanish Colonial Revival houses along Cowper or Waverley. Even the street plan varies; a few areas have extensive alleys, and consequently narrower lots or public streets, but most don't. Because the District grew to include areas built at different times in different styles for different owners, there is no unifying fundamental plan or aesthetic for the entire District. So What Are the Unifying Principles for Professorville? In my opinion, the most important is that Professorville has an exceptional number and density of significant (numbered-category) houses. To maintain this characteristic, those significant houses should be preserved, and additions or modifications to them should be made in a way that maintains their architectural and historical integrity. We can no longer say that Colonial Revival and Craftsman architectural styles are a defining characteristic of the District. However, we can say that diversity of architectural styles is a defining characteristic. Styles other than Colonial Revival and Craftsman have existed in the District since 1891. Examples of innovative styles, like the Sunbonnet House, have appeared from time to time. Occasionally there have been bursts of houses in new styles, like the Spanish Colonial Revival houses that appeared in the 1920s. 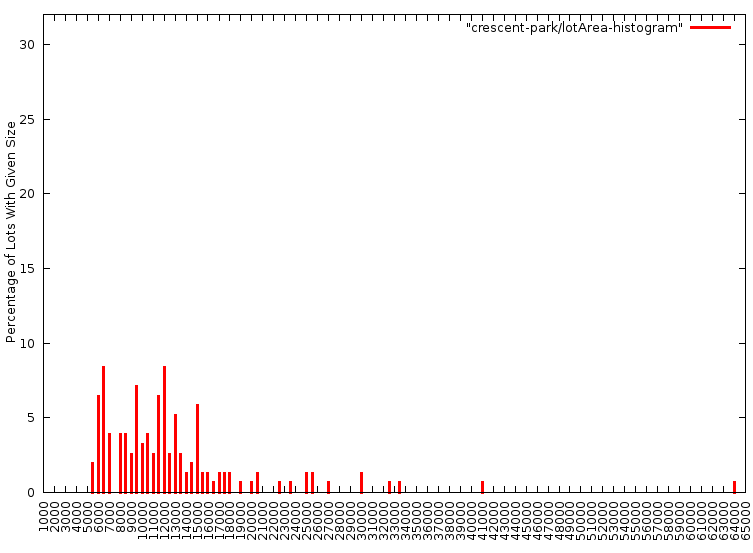 House styles in Professorville tend to cluster. Houses within a block tend to be more alike than houses a few blocks away from one another. There may be considerable variation between adjacent houses, though. We've learned that Professorville is unlike many nearby neighborhoods in that it has a mix of large and small lots with large and small houses. The other neighborhoods tend to be more uniform in those respects. There are many laws and City policies that constrain what the Guidelines can require. I'll mention only one of those here. The most important criterion for determining whether a proposed project is acceptable is whether it meets the Secretary of the Interior's Standards for Rehabilitation. The key information is given in the Guidelines, so I won't repeat it here. Be aware, though, that the language in the Standards has subtleties, and it's best to get advice from the HRB. Some may find the Standards too lax. (For example, there is no prohibition against building in new architectural styles.) However, it's worth mentioning that the Standards place more strict requirements on compatibility than existed when Professorville was created. Had the Standards been in force in the 1920s, Spanish Colonial Revival houses could not have been built in the area (because they're incompatible with the older styles in terms of massing and materials). As a consequence we would not have two of the four Category 1 houses now in Professorville, and we would be missing many other houses built in a style that many consider the signature style of Palo Alto and Stanford today. In the Applicability section on Page 1, the Guidelines extend the applicability of Individual Review to single-story houses and additions in Professorville. This is intended to close a loophole by which one could demolish an existing house and build a new one without a legally-binding review, so long as the new house was single story and didn't require variances. This loophole is a real concern; it has been exploited already (for example, at 225 Lincoln, where a Category 3 house was demolished). On page 17 you'll see references to unifying principles (defining characteristics) of Professorville: individually-significant houses, diversity of architectural styles, etc. You'll also find the Secretary of the Interior's Standards, and mention of the need to consult the HRB as to some of their meanings. Page 18 touches on architectural styles. It lists those that are already in the District, and makes it clear that introducing new styles is permissible (as has happened throughout the existence of the District) so long as the house using them meets the additional requirements of the Guidelines. It also increases the scope of compatibility to an entire block, rather than just a few adjacent houses. This is in part due to the clustering of styles that is common in the District, but is also intended to avoid over-weighting the influence of the immediately-adjacent houses. Page 19 discusses the variety in lot and house sizes that is a defining characteristic. The main reason to emphasize this is to ensure that an addition to or replacement of a small house preserves its perceived size to the extent that's feasible. Page 20 again mentions the larger context for testing compatibility. Page 21 treats issues of architectural style, mixture of styles, and compatibility of new styles in some detail. The text incorporates the observations explained here in previous sections. Page 22 discusses a specific aspect of compatibility, the design of the front entry and how it relates to architectural style. Perhaps this doesn't rise to the level of a defining characteristic for the District, but it does account for some variations. Page 23 elaborates on the care to be taken when modifying an historically significant house, to make sure its integrity is maintained. This relates to the high number and density of significant houses in Professorville, one of the defining characteristics of the District. Finally, page 24 mentions landscaping. There are no specific recommendations here, aside from encouraging applicants to discuss landscaping with the HRB. Perhaps something more valuable will be developed in the future. I hope this information has helped you understand some of the reasoning behind the proposed Guidelines. 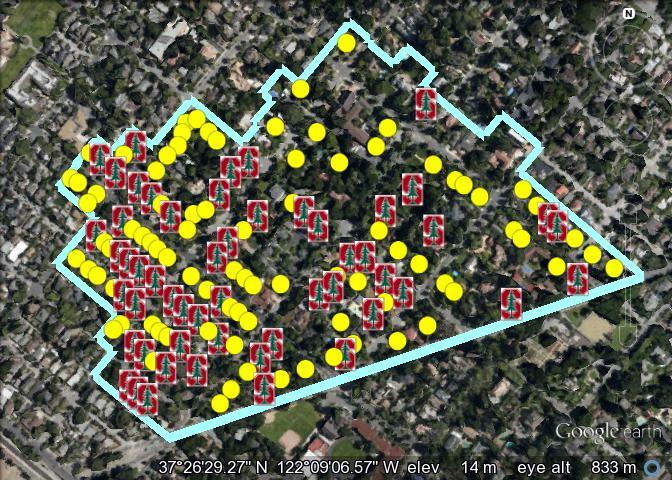 I also hope that the data gathered by the Committee will prove useful to anyone considering preservation or planning issues for Palo Alto in the future. Here is the City's official website for the Professorville Design Guidelines, and here is a PDF file of the final draft Guidelines. Professorville Inventory by Natalie Loukianoff, Pete Childers, and Gogo Heinrich. In this spreadsheet, the column labeled NR contains an X if the property is included in the National Register district. 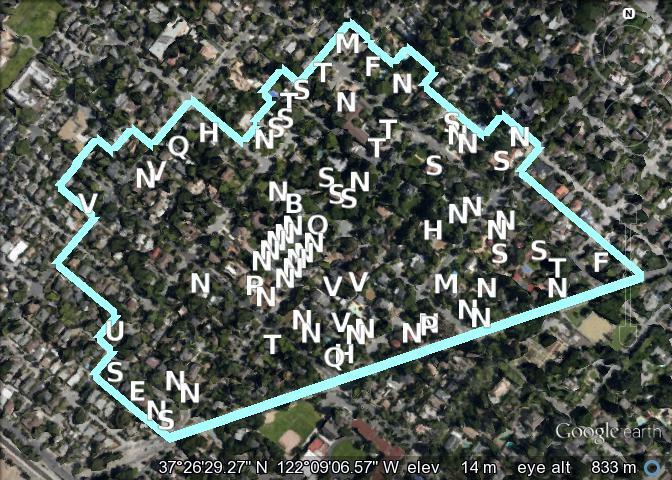 Expanded contains an X if the property is included in the expanded district of 1993. Category contains the significance category number, if any. Cat. Candidate contains an X if the surveyors felt the house might be a candidate for a numbered category. DPR contains an X if there is a California DPR Form 523 describing the house. A Google Earth KML database for Professorville summarizing in several different ways the information from the inventory above. It may also be helpful to have the Google Earth KML database for the Professorville district boundary. A summary of houses by style, date, and category. This file was produced by a C++ program, which also generated the Google Earth KML file. I've linked to it here so that anyone interested in grabbing the machine-readable form of the Professorville Inventory can do so. Here are lot and house area statistics for Professorville, Community Center north of the Park, Crescent Park, and University South bordering Professorville. Palo Alto Master List of Structures on the Historic Inventory at the time the Committee did its work. A more recent version may be available on the City website. A Google Earth KML database for Palo Alto locating (approximately) the structures on the Master List above. This document can be found at http://arden.org/professorville .